JSON Web Token, or more commonly known as JWT, is an open standard  that defines a compact and self-contained structure for securely transmitting information between multiple parties. The contained information can be verified and trusted through digital signatures. JWTs can be integrity protected using a secret using the HMAC algorithm or a public / private key pair using RSA / EC signature algorithms. JWTs consist of three different segments which are separated by a dot. 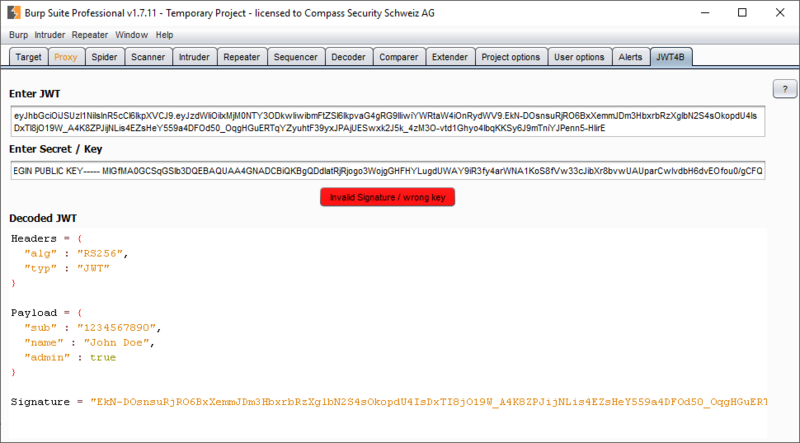 The first two segments are Base64 encoded JSON arrays containing multiple values, the signature is created over both header and payload. 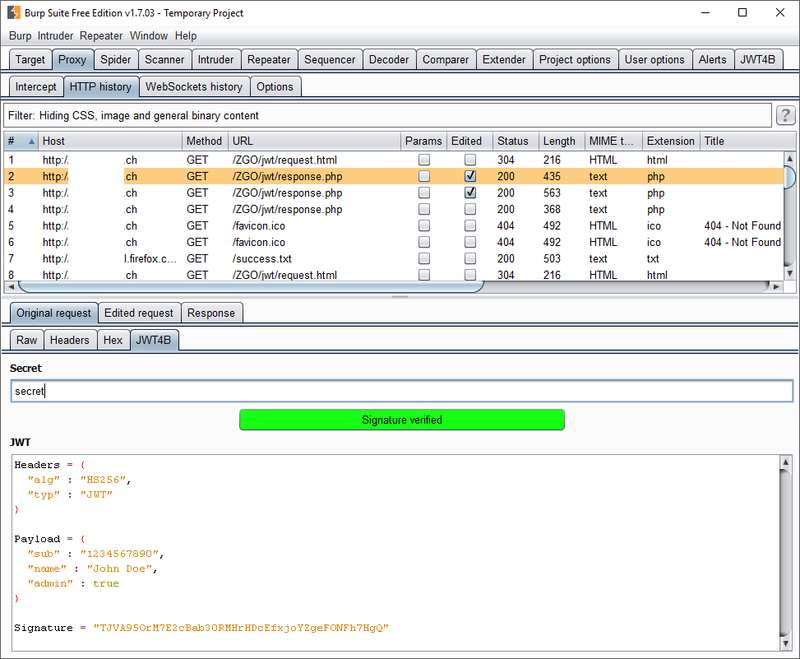 Testing for JWT vulnerabilities is time consuming, as up till now when using Burp Suite , the transmitted tokens had to be decoded, manipulated, encoded (by a third-party tool such as the website JWT.IO  ) and inserted back into Burp Suite. Next to the time overhead needing a separate tool that does not integrate well, JWTs might have a limited validity which requires the necessary steps to be performed very fast. 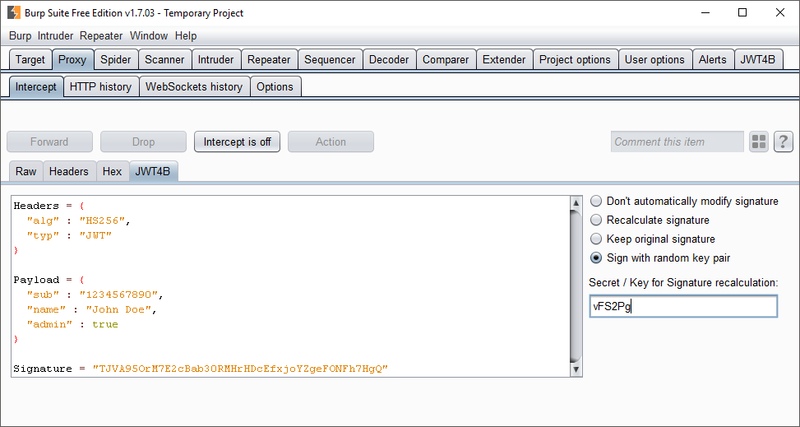 Therefore, two Compass employees developed an extension for Burp Suite during the Hack-Labs  provided by Compass. This extension automates most of the steps, which are necessary for testing JWT in a time effective manner. Furthermore, the plugin is also available through the BApp Store as “JSON Web Tokens“.